Brooklyn Borough Hall is located at 209 Joralemon Street, Brooklyn NY 11209; phone: 718-802-3700. 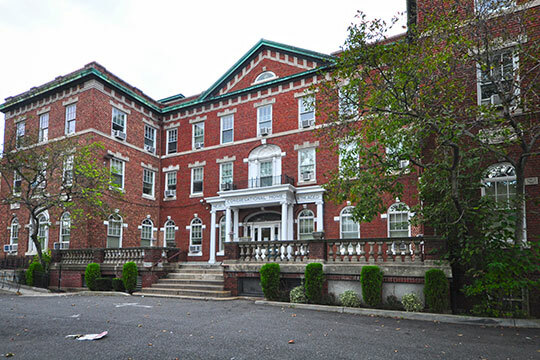 Photo: New York Congregational Home for the Aged, ca. 1918-1927, 123 Linden Boulevard, Brooklyn, NY. Listed on the National Register of Historic Places in 2008. Photographed by User:Onorland (own work), 2012, [cc-by-3.0 (creativecommons.org/licenses/by/3.0)], via Wikimedia Commons, accessed July, 2013. The Town of Brooklyn was one of the municipalities of the Original Kings County, formed by the British in 1682. In 1834, the town of Brooklyn was incorporated as the City of Brooklyn. By 1898, when Brooklyn was consolidated as part of the City of Greater New York, the City of Brooklyn and the County of Kings were coterminous.